Back in October, I picked up a copy of Stephen King’s On Writing that had been sitting on my bookshelf for years. I was about to be a passenger while my then-fiancé drove three hours from New Jersey to Connecticut, and I figured the trip would allot me some solid reading time. I had wanted to read King’s book for a while, but the real reason that I selected it on that particular morning was because the edition was a lightweight paperback — and honestly, I loved the way the grainy texture of the cover felt in my hands. There was no deep or major intellectual decision going on here. Ah, how some of the most seemingly insignificant decisions we make can have the greatest impact! Needless to say, the book is really amazing. King’s ability to write memoir and keep readers enthralled is excellent. He weaves his biographical experiences and insights in with advice and pointers for writer s. I’m only sorry that it took me so long to take the book off of my shelf and start reading it. If anyone else is delinquent in reading this book, I encourage you to make haste and read it as soon as you can. One of the most interesting writing tips that King gives is his advice to read — a lot. Okay, he isn’t the first writer to give that advice. We’ve all heard that same advice a million times. Other writers — and every great writing teacher I’ve ever had — all say that we must read a lot in order to write well. The thing that struck me when I read the advice this time, was that King gives a number. He says that he reads about sixty books a year. Okay, Stephen King, maybe YOU have time to read sixty books a year. What about the rest of us? Seeking validation for my skepticism I checked my Goodreads account, where I have been pretty consistent at logging the books I read for the last few years, and I discovered that I had actually read about forty books the previous year and a similar number the years before. Still not yet convinced that reading an additional twenty books a year was even a plausibility for me, I noted Stephen King’s advice and gently tucked it aside in a corner of my mind for safe keeping. At the same time I started On Writing, I had also been reading a book called Think Like a Freak by Steven Levitt and Stephen Dubner, the authors of Freakonomics. (I tend to do this, start and read multiple books at once. There’s something kind of lonely to me about only having one book “in progress” at a time, but that is fodder for another post!) I had started reading right before I read On Writing, and I finished it just after. This was one of the most fun books I’ve read in a long time. I would say that I am generally an out-of-the-box thinker, and so I really appreciated the authors’ take on various topics and advice for looking at things and thinking differently. This book is an excellent read for anyone who is interested in finding ways to develop a stronger growth mindset or who feels like they just want a new perspective. And wouldn’t you know, these authors also go ahead and recommend the same advice about reading often, citing long lists of successful leaders and business owners who do so. And, just like King, they quantify the number of books per year. In just two days’ time, the notion of reading about sixty books per year — and the incredible value in doing so — was presented to me. I know I couldn’t just consider it a coincidence — that in both of these books written by successful people about successful people that there is a magic number of books we need to read each year — and then move on. I kept thinking about this number. I mean I’d been pretty close with about forty books a year, so maybe adding twenty more books wouldn’t be so tough. I struggled with figuring out how I could fit all of these books into my own schedule. Then, two more things happened over the next few months to convince me that I had to find a way. 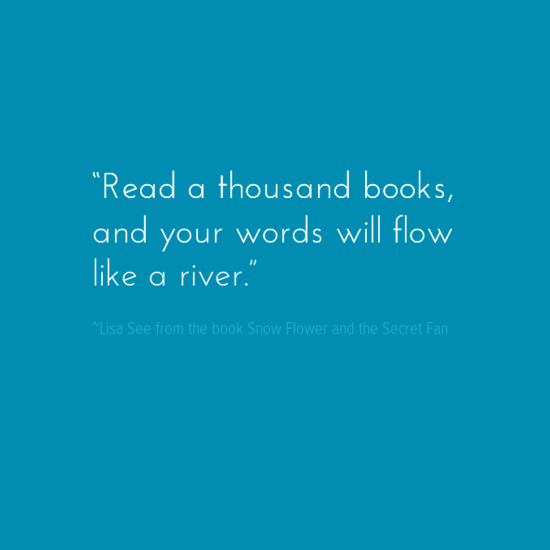 First, I came across this quote by Lisa See from Snow Flower and the Secret Fan: “Read a thousand books, and your words will flow like a river.” I did a little math, and 1000 books divided by 60 books a year works out to almost 17 years. It hit really me then. (Like a big punch in the gut or a hard slap in the face, it hit me.) If I had been reading at the full pace of sixty books a year all along, perhaps writing would be a lot easier for me by now. Perhaps I would be finding and expressing my ideas a little more clearly. It struck me that I had some serious catching up to do on my reading. I did a little more (quick) math, and 60 books a year divided by 52 weeks a year is just over 1 book a week. Broken down like that, I was just about convinced that I could do it, that I could read a book a week. Then, the second thing happened which made it absolutely impossible for me not to commit to sixty books. I logged in to my Goodreads account in January and sure enough, there was the 2015 Reading Challenge, taunting me to set a reading goal for the year. Other Goodreads members had already set their goals. I saw that some had goals of thirty books, and some much higher goals of one hundred and fifty! I know myself pretty well as a reader, and I know that I like to read slowly and take notes and write in the margins of my books when I can. I figured, therefore, that anything over sixty year might be too much for me, so I decided to go ahead, listening to good advice, and set a reading goal of sixty books for the year. I was officially committed to my new goal. As with any resolution set in the cold month of January, there is a chance that the motivation will taper off. There is a strong risk that our beginning-of-the-year good intentions will become waylaid by the hustle and bustle of our modern lives. We have short attention spans these days. We get easily distracted. We are fickle. Future posts will be dedicated not only to accomplishing this goal of reading sixty books, but also what reading sixty books is helping me to accomplish. Thank you, Stephen King, Steven Levitt, and Stephen Dubner. I am very, very thankful that I read your books. WILL YOU JOIN ME IN READING #SixtyBooks? It is with experience-based confidence in my own ability to keep up the pace of sixty books that I offer the same challenge to all of you. Will you commit to reading sixty books? Do you already read sixty books a year? More? I’d love to know. Leave your comments below or use #SixtyBooks on Twitter to keep the conversation going. Sixty books is definitely tough, but I feel like I should try it. I’ve hit over 40 books a couple of times (never quite made 50 though), but I’m dreadful at keeping my GR updated and the last couple of years I’ve been dreadful at reading in general (I’m blaming a move across the world and a wedding but I know I’ve also let myself become distracted). I definitely need to find a way to recommit to reading, because as soon as I do writing does become so much easier. Read about how #SixtyBooks started as Melissa’s personal reading goal and evolved into a reading movement!